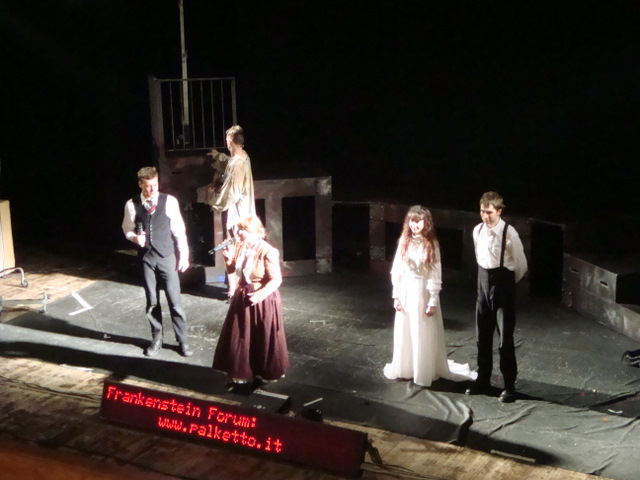 Frankenstein: teatro in lingua inglese per il Volterra. Venerdì 1 aprile le classi 3A e 3B si sono recate al teatro Eden di Treviso per assistere alla commedia in lingua inglese “Frankensten”, tratta dal romanzo di Mary Shelley del 1818. La messa in scena in lingua originale, è stata adattata dalla compagnia di produzione “Palkettostage” costruendo una perfetta ambientazione gotica , con l’utilizzo di strumenti acustici e particolari effetti speciali . It was a normal school day when the teacher came inside the class room and said “Hey Students! Do you want to hear nice news?” “Yes, why not!! “ “We are going to see “Frankestein”!” “Well, are we going to the cinema teacher ?” “Well, no, we are going to the theatre!”. Silence, the classroom became suddently , the air became sad and melancholy and from the end of the class someone screamed “Oh no!”. Well, anyway, we had to do this trip. On Friday morning we had the bus to go to Treviso, around half an hour trip. When we got there, the only fun we had before the play was at the bar!! Well, the play started, and most of us were sleepy.. But, it caught !! It started to become funny, or at least, at the end. The trip started as a nightmare, but slowly it changed into a sweety thing. 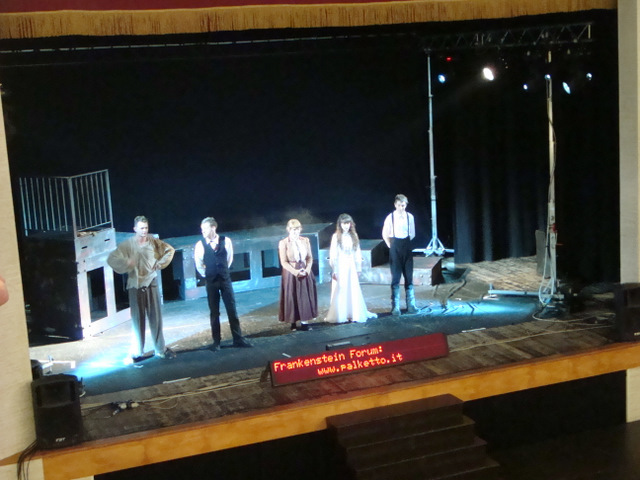 On Friday 1 April I went to the Theatre in Treviso with my class. In the Theatre we saw the musical “ Frankenstein” in English. During the scenes there were a lot of effects. The actors came from England and Wales and they are very young. appreciate the different accents of London and Wales. The atmhosphere was gothic, but there were also some funny parts. The play was really interesting and involving. The actors were good because they managed to change character quickly and they all played very well. I didn’t enjoy all the show very much because I couldn’t see the subtitles very well so I couldn’t understand all the actors said. But the special effets were nice and the actors really great. The trip to Treviso to the theater was really nice. I liked the play and the good actors from England and Wales so much! I think it was a beautiful experience, and why not, I would like to repeat it again in the future. The play we saw in Treviso was very interesting. The musical revealed the textual story of Victor Franckenstain written by Marry Shelley; but I struggled to understand completely the play because the artists played more characters at once.